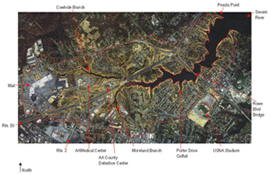 The Weems Creek Conservancy was established in 1982 to preserve, restore, and improve the Weems Creek Watershed in Annapolis and Anne Arundel County, Maryland. Environmental enhancements to Rowe Blvd. What Is The Connection Between Your Health, The Environment And Our Economy? Weems Creek Conservancy is partnering with Friends of the Chesapeake! Weems Creek residents are increasingly concerned about rising health risks associated with unsafe drinking water, polluted rivers and streams and contaminated fish, crabs and oysters. According to recent DNR and EPA studies, the Weems Creek Watershed is severely impacted by storm water runoff which is causing sediment to fill in the tidal creek thus affecting the recreational uses, aesthetics and property values. The problems have been studied and identified - solutions are available. Collaboration among businesses, citizens, government and community organizations is crucial to the recovery of the Watershed. We Need Your Help - We Give Back to You! Together, we can work to make our community cleaner and healthier. Our projects continue to grow rapidly, thanks to all the contributors who believe that good health, a clean environment and a robust economy is important. To achieve our goal, we need your help. It is your support through donations that allow us to continue to grow and to improve our neighborhood. To meet these needs, we are asking you to join our partner, Friends of the Chesapeake™ by making a donation. When you support Friends of the Chesapeake™, you become part of the FOTC Network and receive benefits for supporting us. Go to Friends of the Chesapeake Website to learn more!